It was started by George Romanta Kinney in 1894 in Waverly New York. By the end of 1929 the chain had 362 stores.Foot Locker began as a division of Kinney Shoes in 1974. On August 31 1963 the G.R. Kinney Company was sold to F.W. Woolworth. 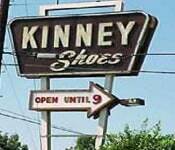 On September 16 1998 the Ventor Group announced that Kinneys 467 shoe stores and 103 FootQuaters stores would close. However Footlocker would remain open.